Applaws Recipe Selection is a scrummy array of complementary adult cat food recipes, each made from only completely natural ingredients. Made with choice cuts of chicken breast, freshly caught ocean fish, or dolphin friendly tuna, and cooked in a savoury broth with delicious cheese or sweetcorn or wholesome rice, each recipe is completely free of animal derivatives and artificial additives of any kind. 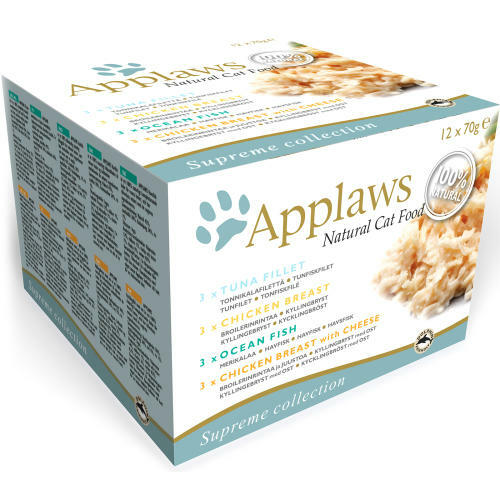 Comprising Chicken Breast, Chicken with Cheese, Ocean Fish, and Tuna Fillet recipes, Applaws Natural Cat Food is the perfect way to treat your feline friend every day. Tuna Fillet (Tuna fillet 75%, Rice 6%, Fish broth 19%); Chicken Breast (Chicken Breast 75%, Chicken Broth 24%, Rice 1%); Ocean Fish (Mackerel 45%, Tuna fillet 30%, Rice 1%, Fish broth 24%); Chicken with Cheese (Chicken Breast 70%, Cheese 5%, Rice 1%, Cooking water 24%). Protein 14%, Crude Fibres 1%, Crude Oils and Fats 1%, Crude Ash 2%, Moisture 82%.